The arrival of the WTA Finals in Shenzhen this year is a huge milestone for Chinese tennis, with the host city determined to impress by staging a tournament that can compare to the Grand Slams. From Oct 27 to Nov 3, the cream of the women's game will battle it out at the end-of-season event at Shenzhen Bay Sports Center - and with the prize money doubled this year, organizers hope the Finals will feel more like a major. Tournament co-director Eddy Liu has announced that a total amount of $14 million will be up for grabs at the 2019 Finals. "Many people subscribe to the theory that the WTA Finals is the closest tournament to the Grand Slams, and we have been thinking about how to turn that theory into reality," said Liu, who is also the CEO of organizer Gemdale Sports, at the event's global launch in Shenzhen last Friday. "The first step is to level up the prize money. As a 40-year-old city, Shenzhen will host a tournament that boasts an even longer history. That for sure will bring pressure to us, but we are highly confident. "First of all, Shenzhen itself is a legend of Chinese economic development. If we can create a world-renowned city of creation and innovation in 40 years, we can build the WTA Finals into one of the world's top tournaments in a decade. "The character of our city determined that we would accept that challenge." Last year, Shenzhen won a WTA vote to host ten editions of the Finals until 2028, ending the tournament's five-year stint in Singapore. Since then, Shenzhen's local government has put its full weight behind the preparations, much to the admiration of WTA CEO Steve Simon. "We've received great support from everybody in Shenzhen," said Simon in an exclusive interview with China Daily. "Shenzhen's local government has been terrific to work with so far. We are also supported by the Chinese Tennis Association (CTA). "When I look at what the city stands for and what has happened in the city, I see tremendous growth in a very short period of time, as well as innovation and beauty." Simon added that fans should expect plenty of new features at the Shenzhen Finals, describing the tournament as an evolving event. Organizers are also hoping that the Finals will inspire more kids to pick up rackets as the nation looks to produce a new superstar to emulate two-time Grand Slam winner Li Na, who retired in 2014. "The WTA Finals is a jewel of the women's tour so it should help the promotion and development of tennis in China," said Huang Wei, vice-president of the CTA. "People need stars to attract them to participate in the sport. The Finals are significant in terms of encouraging more children to play tennis." WTA boss Simon reckons China will be cheering on the next Li Na sooner rather than later, with half a dozen Chinese women now ranked in the world's top 100. "If you think back to 2000, there was only one Chinese player in the top 100. Now we have six players, which is significant for any country," he told China Daily. "Especially in junior competitions, there have been a number of young Chinese girls who have shown some great results. "The chances of finding the next Li Na are very bright, and it's just a matter of time." 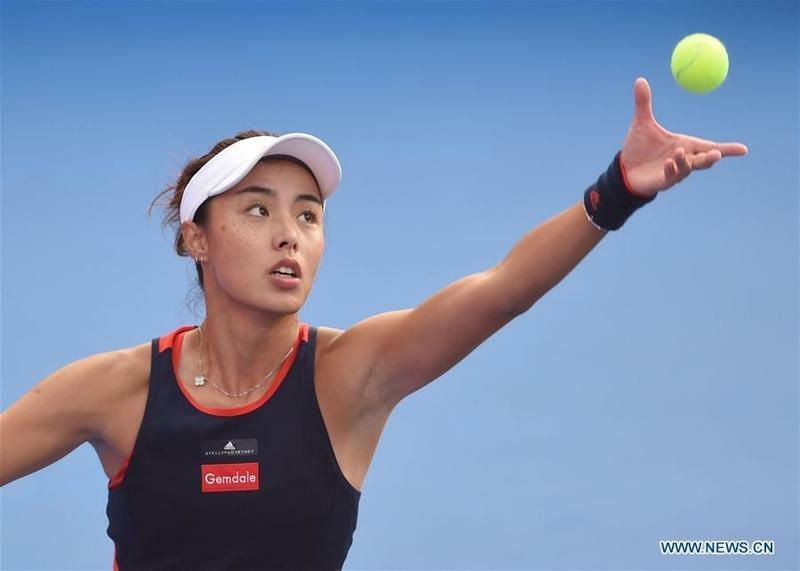 The future for Chinese tennis does indeed look rosy, with China's top female player, Wang Qiang, now ranked 18th in the world and looking capable of deep runs at the Slams after last year winning two WTA titles and pocketing gold at the Asian Games. Earlier this month, 24-year-old Wang Yafan broke into the world's top 50 after claiming her first WTA singles title by beating fifth-seeded American Sofia Kenin in the final of the Acapulco Open. At the same event, China's Zheng Saisai partnered with Victoria Azarenka to win the doubles crown, beating third seeds Guiliana Olmos and Desirae Krawczyk in the final. In another promising sign, world No 40 Chinese player Zhang Shuai partnered with Sam Stosur to win the Australian Open doubles title, defeating defending champions Timea Babos and Kristina Mladenovic in the Melbourne final. Meanwhile, the grassroots game can expect renewed support from the WTA, with Simon revealing that the global governing body will be working closely with the CTA to promote tennis in China. "I do think having these events here with the best players in the world plays a huge role in influencing young people," Simon said. The arrival of the WTA Finals in Shenzhen this year is a huge milestone for Chinese tennis.